The aliens are coming! Make cute little UFO’s applique in about 30 minutes. 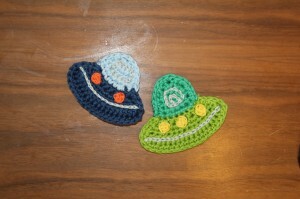 Yarn: I used SMC Catania grande, 100% cotton, 50 g/ 63 m, in light blue, light green, blue, green. Catania in silver, yellow and orange, 100% cotton. You can use any light worset or sports yarn that goes with a 4 and 3 mm hook. Ch3 at the beginning of each row counts as first dc throught the work. Last dc(s) in row will be made in the 3rd chain of the pervious round. start at the upper end of the bottom part. 1. Draw a loop, 2 sc together, 5 sc (6sc)2. – 4. ch1, 6 sc5. ch 1, 2 tog, 2 sc, 2 tog (3 sc)6. ch 1, 2 times 2 tog (2 sc)fasten off, weave in the ends. Make a round of sc in each stitch around the work, 2 sc in the corner stitches. 2. ch 1, 4 sc, ss in first sc. fasten off, leave a long tail to sew it on the UFO. Embroider the cockpit and a line in the middle of the bottom part of the UFo in silver (3mm hook). Sew lights on the UFO.